Inventory We are a resale marketplace, not a box office or venue. Ticket prices may exceed face value. This site is not owned by 5th Avenue Theater . 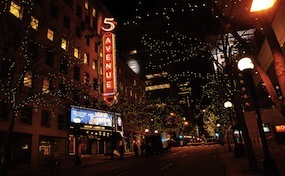 The 5th Avenue Theater in Seattle provides an intimate environment that seats 2,130 and plays host to Broadway shows, concerts, and other entertainment event. This landmark theater building features not only the nationally touring Broadway shows, but often is used as a testing ground for new musicals pre-Broadway. Opened in 1926, the 5th Avenue Theater is owned by the University of Washington and is home to the non-profit 5th Avenue Musical Theatre Company. Recent shows have included A Christmas Story, Aladdin, Catch Me If You Can, Cinderella, Guys and Dolls, Les Miserables, Oklahoma, and West Side Story. The 5thAvenue.Theatre-Seattle.com is not a primary vendor, supplier, or affiliated with any official website. We proudly are privately owned and operated concentrating in online sales in the secondary market. Ticket prices may be well below or above face value and will fluctuate with demand. To purchase tickets for all 5th Avenue Theatre Seattle events simply click on the show of interest or call our operators at anytime.